Abstract: This article presents a description Triglav, a god or complex of gods in Slavic mythology. Oracular ceremonial that take place for Triglav was the same as the oracular ceremony of Svantevit from Arkona temple in Rugia island. The informations were taken from the medieval sources such as the Vita Ottonis of Otto from Bamberg and the chronicles from Prieflingen monastery. This triad is part of the Indo-european system of multi-headed deities (polycephaly). Introduction: Triglav (lat. Triglaus, Tриглав, Trihlav, Trygław, Trigelawus, Triglous, Tryglav) represents at Kiev a group of three gods: Perun, Dažbog and Stribog. At Novgorod in 9th century, The Big Triglav represents Svarog, Perun and Svantevit. Before this period of time, in Novgorod, Triglav was represented by Perun, Svarog and Veles. At Czechs, Triglav was represented by a goat with three heads, who represented strenght and tenacity. This triad was represented by an idol with three heads (polycephaly), at Szczecin, where we can find more temples dedicated to this God. Otto from Bamberg reports us that Baltic Slavs were doing sacrifices in name of Triglav triad. He state that Triglav was summus deus (Ebbo, Vita Ottonis), being venerated in Wolin and Branderburg cities too. Refering to word etimology, we can see that Triglav represents only an epithet of supreme God. His name should be translated as “the three-headed”. An other explanation of etimology would attributes Greek origins to the name. Greeks named Hecate Tricephalos Goddess as “the three-headed goddess”. It’s possible that monks who mentioned God name under Triglav form, to pick up the greek name to define this Slavic deity, like late Roman authors used Gods names Roman pantheon in German deities. At Tacitus, Wotan is Mercury. In central part of Serbia, near Kralijevo city, there is a massif called Troglav. 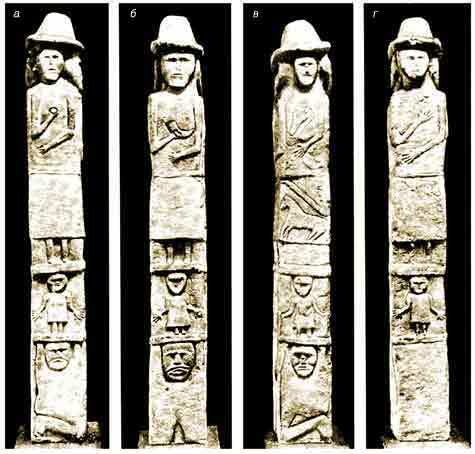 In Slavic world existed multi-headed idols named “The little Triglavs”, which in comparison with “Big Triglavs”, were bringing together little deities. Some Slavic mihtology researchers thought that Triglav was god of war at old Slavic. At Southern Slavs, because of emperor Traian, the cult have produced an interference of this with Slavic Triglav deity.